Your home is your castle, now you can make it so! Field Stone has provided timeless beauty and character for centuries. Now more than ever before, with the advances of technology, people can take advantage of new architectural Field Stone veneer which is produced in a cost effective manner, and designed to enhance any residential or commercial building project. Grizzly Ridge Field Stone veneer has the look and durability of actual field stone. Our Fieldstone can offer a mosaic of rugged, irregular shapes, hues, and textures that merge into an appeal of timeless character, making your project unique from any other. The Grizzly Ridge Field Stone veneer may be used on exterior walls to enhance the finished appeal of your home, as a beautiful interior feature wall, your fireplace, or even beautiful walk ways or patio stones. The field stone may be combined with other Grizzly Ridge stone to further enhance your project. Our Field Stone is a logical alternative to natural stone at an affordable price without compromising the beauty of Mother Nature's own creation. Many colors combinations to choose from! You may want to enhance your Field Stone veneer by combining it with a percentage of other stone veneer styles such as Ledge Stone, Stack Stone, Limestone, or European Limestone. 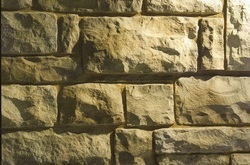 Natural Ledge Stone has provided timeless beauty and character for centuries. It has been a timeless classic. 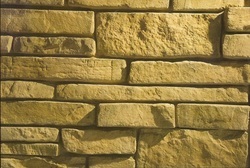 The weathered rough face of Ledge Stone, in particular, brings the depth and rugged refinement to any exterior or interior wall or surface. 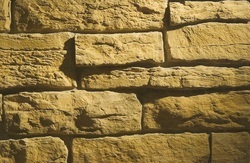 Ledge Stone: timeless, attractive and charming! Now more than ever before, people are taking advantage of the new Architectural Ledge Stone veneer, which is now more cost effective and designed to enhance any residential or commercial building project with the advancement in technology. Grizzly Ridge Ledge Stone veneer has the look and durability of actual stone, and has the rustic character you are looking for with the irregular and rough texture giving a home interior and exterior a bold natural appeal. It merges into an appeal of timeless character, making your project unique from any other. 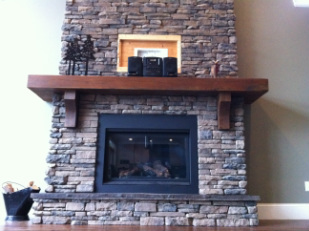 Again, Grizzly Ridge Ledge Stone veneer may be used on exterior walls to enhance the finished appeal of your home, as a beautiful interior feature wall, on your fireplace, or even beautiful walk ways or patio stones. Our Ledge Stone is a logical alternative to natural stone at affordable price without compromising the beauty of Mother Nature's own creation. Many colors combinations to choose from! 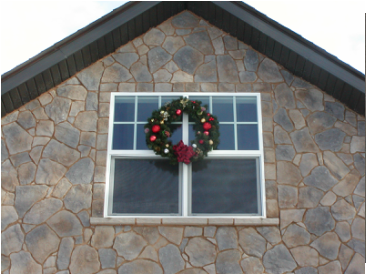 You may want to enhance your Ledge Stone veneer by combining it with a percentage of other stone veneer styles such as Stack Stone, Limestone, or European Limestone. 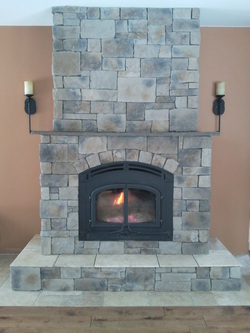 If you are looking for a rustic but more uniform look, the Stack Stone might be what you are looking for. Though Stack Stone is more uniform in its horizontal shapes, is still similar to our Ledge Stone in its timeless beauty, rugged hues and texture. Instead of a mosaic of different shapes and sizes, the stack stone lends itself nicely to a uniform horizontal interest. 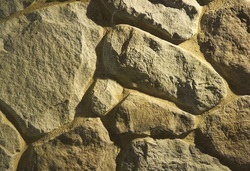 Stack Stone brings depth and rugged refinement to any wall or surface whether exterior or interior. It has become a favorite for fireplaces, as well as another favorite embellishment of new homes, pillars, and garage footers. Our Architectural Stack Stone is another logical alternative to natural stone at an affordable price without comprising the beauty of Mother Nature’s own creation. Many colors combinations to choose from! You may want to enhance your Stack Stone veneer by combining it a percentage of other stone veneer styles such as Ledge Stone, Limestone, or European Limestone. If you are looking for larger stones that are square and rectangular in shape, yet still rustic in appeal, then the popular and beautiful Hackett Stone might be what you are looking for. 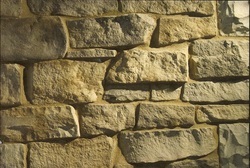 Hackett Stone is another stone which provides timeless beauty and character. Now more than ever before, people can take advantage of new architectural stone veneer which is cost effective and designed to enhance any residential or commercial building project. Our Hackett Stone veneer has the look and durability of natural stone with the rustic character and warmth of larger to smaller square and rectangular shapes of stones. Hackett Stone brings depth, warmth and refinement to any wall or surface whether exterior or interior with a bold natural appeal. Our Architectural Hackett Stone is another logical alternative to natural stone at an affordable price without comprising the beauty of Mother Nature’s own creation. Many colors combinations to choose from! 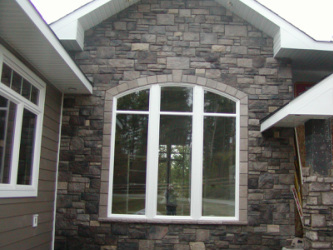 You may want to enhance your Hackett Stone veneer by combining it with other stone veneer styles such as Ledge Stone, Limestone, or European Limestone. "It is now time to forget the Joneses; now you can look like the Vanderbilt’s." Limestone has provided timeless beauty and character for centuries. It is a classic with its weathered rough face of Limestone, bringing a depth and rugged refinement to any exterior or interior wall or surface. Now more than ever before, people can take advantage of new architectural stone veneer which is cost effective and designed to enhance any residential or commercial building project. Grizzly Ridge Limestone veneer has the look and durability of actual stone with a rustic character and the warmth of larger to smaller square and rectangular shape of stones. Limestone brings depth, warmth and refinement to any wall or surface whether exterior or interior with a bold natural appeal. Our Architectural Limestone is another logical alternative to natural stone at an affordable price without comprising the beauty of Mother Nature’s own creation. Many colors combinations to choose from! You may want to enhance your Limestone Stone veneer by combining it with a percentage of other stone veneer styles such as Ledge Stone, Stack Stone, or European Limestone. European Limestone; timeless, attractive and charming! Natural Old World European Limestone has always provided timeless beauty and character for centuries. It has been a timeless classic, in particular, the weathered rough face of European Limestone, brings the depth and rugged refinement to any exterior or interior wall or surface. Our Architectural European Limestone veneer has that rugged look and durability of actual Old World European Natural Limestone, it has a rustic character with the irregular and rough natural texture giving any interior or exterior wall that bold natural appeal. It blends timeless character and natural texture to make your project more unique than any other. The Grizzly Ridge European Limestone veneer is another logical alternative to natural stone at an affordable price without comprising the beauty of Mother Nature’s own creation. Many colors combinations to choose from! You may want to enhance your European Limestone veneer by combining it with a percentage of other stone veneer styles such as Ledge Stone or Limestone. Grizzly Ridge Old World Cobble Stone custom veneer has the look and durability of actual cobble stone without the extra weight which make it necessary need for footings and perhaps heavy equipment to aid in installation . Cobble Stone veneer has many uses! It may be used as an exterior accent or finish to your home, as an interior feature wall, walk ways, or on fireplaces. 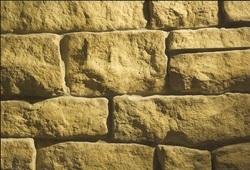 DESERT STONE, attractive and charming combination of Ledge stone, Hackett Stone, and Stack Stone. Natural Stone has always provided timeless beauty and character for centuries. 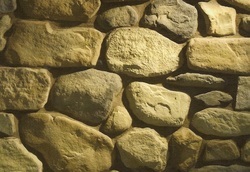 Desert Stone brings out the best of a combination of Ledge stone, Hackett stone, and Stack stone can offer! It has definitely been a timeless classic, the weathered rough face and combination different shapes of Desert Stone, in particular, brings the depth and rugged refinement to any exterior or interior wall or surface. Grizzly Ridge Desert Stone veneer has the look and durability of natural stone, has beautiful rustic character by incorporating the regular shape and rough texture of Hackett Stone and Stack Stone with the irregular shapes of Ledge Stone. Desert Stone merges into an appeal of timeless character, no doubt making your project very unique. Again, Grizzly Ridge Ledge Stone veneer may be used on exterior walls to enhance the finished appeal of your home, as a beautiful interior feature wall, your fireplace. Our Architectural Stone veneer is a logical alternative to natural stone at affordable price without compromising the beauty of Mother Nature's own creation. Now with the advances of technologies more than ever before people are taking advantage of the new Architectural Ledge Stone veneer which is more cost effective and designed to enhance any residential or commercial building project. Weathered Face Stone has always provided timeless beauty and character for centuries. It has definitely been a timeless classic, the weathered rough face, in particular, brings the depth and rugged refinement to any exterior or interior wall or surface. Our Architectural European Limestone veneer has that rugged look and durability of actual Old World European Natural Limestone, has the rustic character you are looking for with the irregular and rough natural texture giving any interior or exterior wall that bold natural appeal. It merges into timeless character, making your project unique from any other. The Grizzly Ridge European Limestone veneer is another logical alternative to natural stone at an affordable price without comprising the beauty of Mother Nature’s own creation. Natural Stone has always provided timeless beauty and character for centuries. It has definitely been a timeless classic, the weathered rough face of Rustic Cobble Stone, in particular, brings the depth and rugged refinement to any exterior or interior wall or surface. Now with the advances of technologies more than ever before people are taking advantage of the new Architectural Stone veneer which is more cost effective and designed to enhance any residential or commercial building project. Grizzly Ridge Stone veneer has the look and durability of actual stone, has the rustic character you are looking for with the irregular and rough texture giving a home interior and exterior a bold natural appeal. It merges into an appeal of timeless character, making your project unique from any other. Again, Grizzly Ridge Stone veneer may be used on exterior walls to enhance the finished appeal of your home, as a beautiful interior feature wall, your fireplace, or even beautiful walk ways or patio stones. Our Stone is a logical alternative to natural stone at affordable price without compromising the beauty of Mother Nature's own creation. 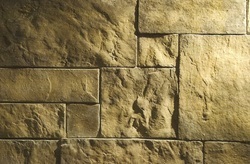 The weathered look of Rugged Split Face Stone, in particular, brings depth and rugged refinement toany wall or surface. Grizzly Ridge Stone veneer has the look and durability of actual stone, has the rustic character you are looking for with the irregular and rough texture giving a home interior and exterior a bold natural appeal. It merges into an appeal of timeless character, making your project unique from any other. Again, Grizzly Ridge Stone veneer may be used on exterior walls to enhance the finished appeal of your home, as a beautiful interior feature wall, your fireplace, or even beautiful walk ways or patio stones. Our Stone is a logical alternative to natural stone at affordable price without compromising the beauty of Mother Nature's own creation. If you are looking for larger stones that are square and rectangular in shape, yet still rustic in appeal, then the popular and beautiful Euro Castle Stone might be what you are looking for? 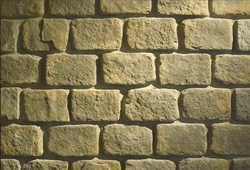 Castle Stone is another stone which provides timeless beauty and character. Now more than ever before, with the advances of technologies, people can take advantage of new architectural stone veneer which is cost effective and designed to enhance any residential or commercial building project. Our Castle Stone veneer has the look and durability of actual stone with the rustic character and warmth of larger to smaller square and rectangular shapes of stones. Castle Stone brings depth, warmth and refinement to any wall or surface whether exterior or interior with a bold natural appeal. Our Architectural Castle Stone is another logical alternative to natural stone at an affordable price without comprising the beauty of Mother Nature’s own creation. Grizzly Ridge Classic Brick veneer has the look and durability of actual brick without the extra weight, or need for footings. 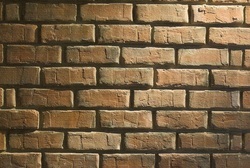 The Classic Brick is very easy to install with the look of an actual brick wall. Classic Brick veneer is popular as an exterior finish to your home, as an interior feature wall, and for fireplaces. Many colors combinations to choose from! Class Brick sizes; Length: 9.5" Height 2.5" Thickness .5"